The other night I’d had enough of thinking and working for clients, so I indulged myself in a spirograph therapy session. 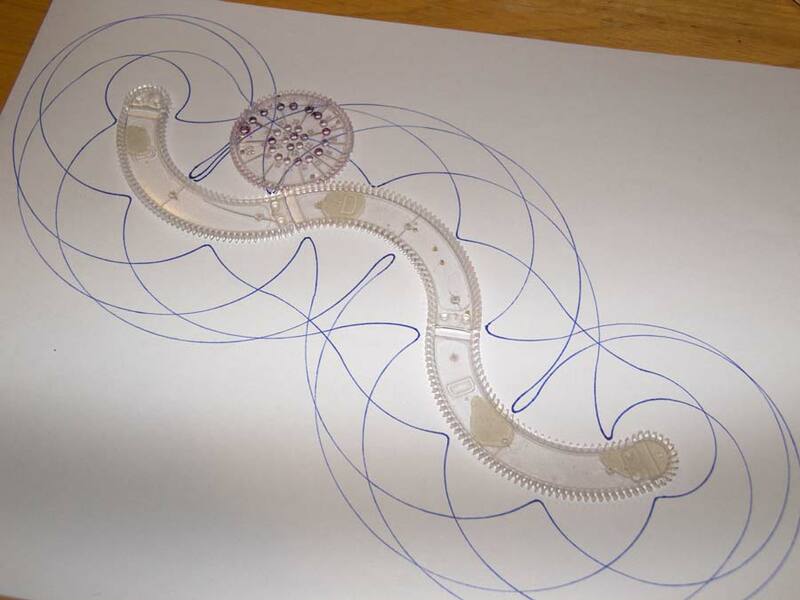 I took out my old Super Spirograph and set up a wave pattern, attaching the pieces to the paper using the putty that comes with the new set – which is basically poster putty that you can buy at a stationery store. I chose a wheel that would fit on the paper (number 63) and proceeded to draw using hole 1. You never know with these irregular shapes when the wheel will come back to its original starting point. 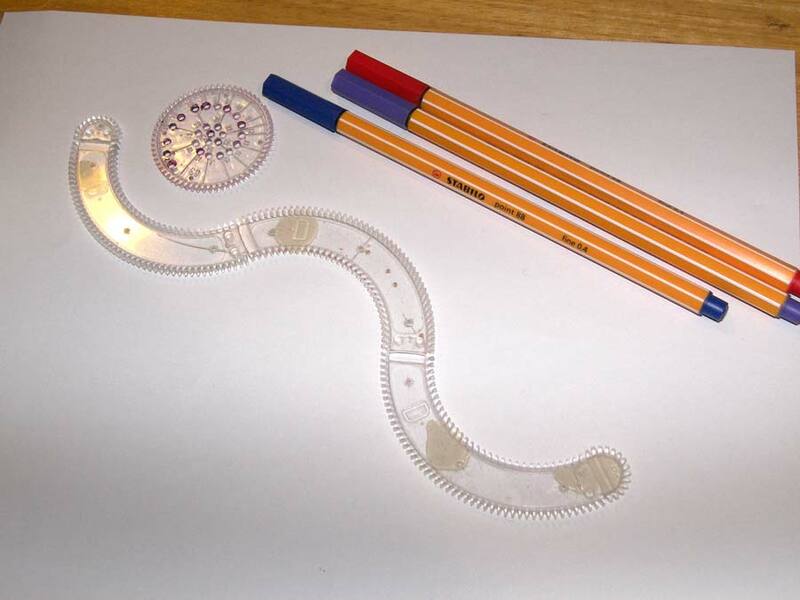 In this case, after going around to create the pattern in the second picture, the pen landed one tooth over from its starting point. I knew from experience that completing the pattern would create a dense design, take a long time and not be as interesting as it was now – it would hide the shapes of the loops on the concave sides, which I found interesting. So I went around once more with the dark blue pen, then twice more with red to create the design you see. The therapy session worked and I went to bed happy. The complete pattern would have 268 points on it according to my calculations ! Now 268×4 = 1072, which is almost 17×63 or 1071. So we have efectively a 17-pointed pattern. 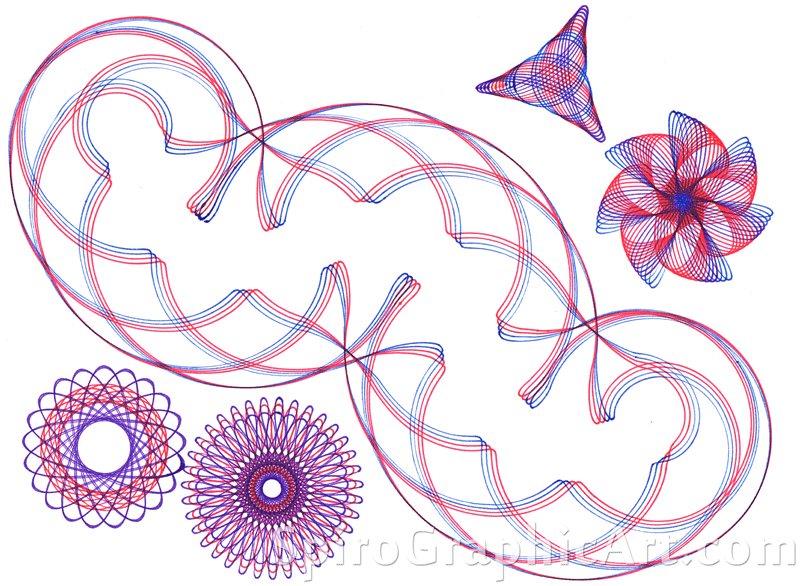 Spirograph resurrected my artistic hobby. I’m an art major and work in advertising. I stopped drawing many years ago as Adobe Products started to spoil my everyday creativity. Just getting into Spirograph and for the first time again, drawing with a fine marker using a Spirograph wheel, it is a little scary if I make a mistake on paper. 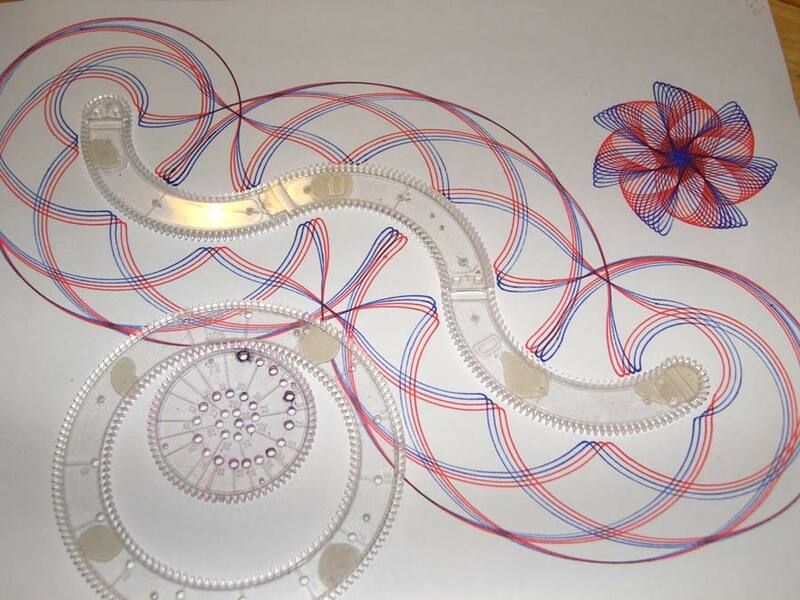 I love nothing better than creating and completing a beautiful design with my Super Spirograph. I dislike nothing more than almost finishing a beautiful design and having a pen or wheel slip and botch it all. It is like playing a round of golf on a good day vs. a bad one! I hear you. And a confession: After scanning the designs to put on the website, I get to photoshop them, and can remove the worse messes – stray lines or blotches. Maybe I shouldn’t, and keep it real!